The Oberoi Hotel Madinah | Karwan-e-S A Travels & Tours Pvt. Ltd. The Oberoi, Madina enjoys an unrivalled position amongst luxury hotels in Madina, just steps away from Al Masjid Al Nabawi Al Sharief (the Prophet’s Mosque) whose green dome marks the final resting place of the Prophet Mohammed. The hotel is equipped with a large number of spacious and efficient lifts on each floor, so that getting to the mosque is effortless. In addition, for guests’ comfort and assurance, the closest entrance from the hotel to the mosque is the ladies’ gate. Those looking for a luxury dining restaurant in Madina will find their appetites more than satisfied by the range of fine international and Arabic cuisines served at The Oberoi, Madina. From 24-hour dining at Al Ansar to Indian fine dining at Al Andalous, Japanese delicacies and a unique English tea house experience, our masterchefs guarantee an authentic dining experience. The Oberoi, Madina offers is the only luxury hotel in Madina with a health club, massage and steam rooms (for men only). With incomparable views, an unsurpassed location and dedicated, personalised service, The Oberoi, Madina guarantees an unforgettable stay in this historical, holy city. 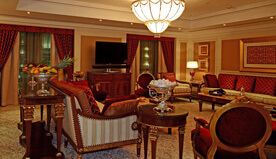 The Prophet’s Mosque can be seen from every room in the Grand Royal Suite. Spread over 3500 square feet (325 square metres), this suite spans two king-size bedrooms, three bathrooms, an office with a library, a dining room for twelve people and a kitchenette. 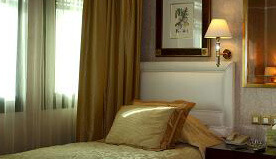 Rooms are adorned with lush gold and red furnishings, and bathrooms are fitted with a bathtub and shower. The health centre features a fitness suite, a massage room, a relaxation area and a steam room for up to eight people. The fitness suite is equipped with cardiovascular machines fitted with personal audio-visual systems. The health centre welcomes male guests. 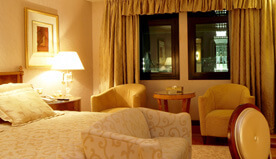 The Oberoi, Madina enjoys a position unrivalled by other luxury hotels in Madina. Located just steps away from Al Masjid Al Nabawi Al Sharief (the Prophet’s Mosque) in the heart of this holy city, our rooms and suites are afforded immediate, unspolit views of the mosque on one side of the hotel, and across the vibrant city on the other. Well-lit, richly carpeted corridors are serviced by an abundance of rapid, spacious lifts, to enable effortless access to the mosque, while all rooms are large, majestically furnished and feature luxurious bathrooms with showers and bathtubs. The Grand Royal Suite is spread across 3500 square feet (325 square metres) and features two king-size bedrooms, an office with a library, a living room, a twelve-seater dining room, two bathrooms and a kitchenette with a separate service entry. Every room in this suite affords uninterrupted views of the Prophet’s Mosque. 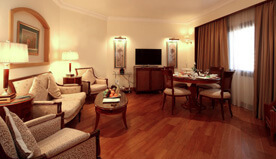 Guests can enjoy 24-hour, multi-cuisine, in-room dining in the exquisite, silver service dining room of this suite. Entertainment is provided by over seventy television channels that can be enjoyed on any of the three 56″ flat screen televisions. DVD players are available on request. 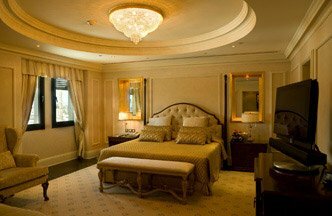 Attached to the master bedroom of the Grand Royal Suite is a bathroom of exquisite Italian marble, featuring a full-length bathtub and a unique, embedded rain shower, both gleaming with gold-plated fittings. The guest bedroom is also equipped with an immaculate bathtub and a separate shower. One 52″ TV in sitting room and two 42″ TV in bedrooms. 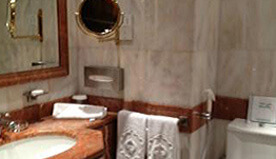 Spread across 1345 square feet (125 square metres), Royal Suites encompass a master bedroom with an extra large king-size bed and an ensuite bathroom, a twin bedroom with an ensuite shower room, a silver service dining room and a living room – with a rotating television between the two areas – and a luxurious marble tiled powder room. From the ornately framed windows of this suite, guests are afforded spectacular views of the ancient Al Masjid Al Nabawi Al Sharief (Prophet’s Mosque) and the canopied courtyards of pilgrims at prayer. Guests also have an unspoilt view of the mosque’s signature green dome. The master bathroom in this suite is tiled in dramatic cream and deep brown marble, fitted with a rain shower, and a separate, full-length bathtub with a hand shower and a whirlpool. Attached to the twin room is a bathroom with a glass panelled shower. An additional powder room is located near the living area. The Junior Suite is spread across 730 square feet (68 square metres) and spans a master bedroom with a master bathroom and a living room with an attached shower room. Suites feature polished wooden floors carpeted with deep, handmade rugs and are furnished with a luxurious king-size bed, a comfortable sofa and armchairs. Our Junior Suites offer uninterrupted views of either the city of Madina, or the Prophet’s Mosque and its courtyards bustling with devotees. Mosque view suites are equipped with two 32″ televisions and three telephones, while our city view suites have two 40″ televisions and four telephones. The master bathroom is fitted with a full-length, gleaming enamel bathtub and a wall-mounted shower, with unique gold and chrome mixed fittings. Attached to the living room is a shower room, for guests’ convenience. Both rooms are fitted with fantastic cream and deep, pink, Italian marble surfaces. 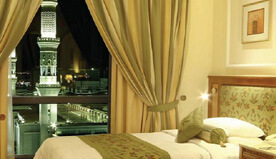 Our Standard Rooms are afforded magnificent views of either the Prophet’s Mosque or the city. Through large windows, framed with ornate, Arabic style fretwork, guests can observe the constant buzz of people at the mosque and its surrounding courtyards, or wonder at the delightful cityscape of Madina. Guests enter the room on polished marble and wooden floorboards ornamented with rich, green rugs, to find a bright, spacious accommodation furnished with luxurious twin beds, deep green armchairs and a smart writing desk. The room is also fitted with a walk-in wardrobe with ample luggage space. Tiled with dark pink and creamy Italian marble surfaces, radiant with spotlights reflecting off chrome fittings, the bathroom is simply magnificent. It is fitted with a full-length enamel bathtub, high-pressure, wall-mounted shower and bidet, for guests’ convenience. Those looking for a luxury dining restaurant in Madina will find their appetites more than satisfied by the range of fine international and Arabic cuisines served in the restaurants at The Oberoi, Madina. From 24-hour dining at Al Ansar, to Indian fine dining at Al Andalous; Japanese delicacies in the city’s first ever Japanese restaurant: Kyoto, and high tea in our English style tea house, we guarantee an exciting, authentic dining experience. For guests who wish to socialise with friends, the lobby is a wonderful space to enjoy coffee, dates and conversation at any time. 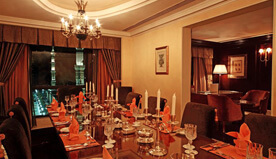 Kyoto, Al Ansar and the Tea House also have private, luxury dining areas for groups. Kyoto is Madina’s first ever Japanese restaurant – a modern, stylish, dining space secluded behind glass doors etched with Japanese cherry blossoms and adorned with large, golden characters of Japanese writing. Open for lunch and dinner, Kyoto serves fresh sushi, sashimi, teppanyaki and shabu shabu. Ornamented with a marble floor of complex patterns, painted with traditional Mughal designs, and set with tables placed around columns and under arches, Al Andalus is a testimony to India’s Islamic-infused past. Open for lunch and dinner, Al Andalus serves classic and modern Indian cuisine. Step inside the Tea House and back into British history. 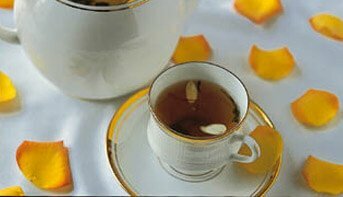 Furnished with crisp, white linen tables, elegant chairs and ornate carpets – just like a quaint, olde English tea shop – the Tea House serves high tea, cakes, pastries, sandwiches, Arabic and European-style coffees, and a range of herbal, green and black teas. Al Ansar is a 24-hour dining space, filled with lavish hot and cold buffets of Arabic, Western and Indian cuisine for breakfast, lunch and dinner. It is painted with Arabic designs and lit by fantastic, traditional glass lights suspended from the ceiling. Al Ansar has semi-private seating for up to forty people. The health club at The Oberoi, Madina is the only one of its kind among five star hotels. It features a fitness suite whose cardiovascular machines are all fitted with personal televisions and audio systems, a massage room, a white marble steam room for up to eight people and a relaxation room. The health club welcomes male guests, and has a fully trained, experienced, all male staff.